It’s done! 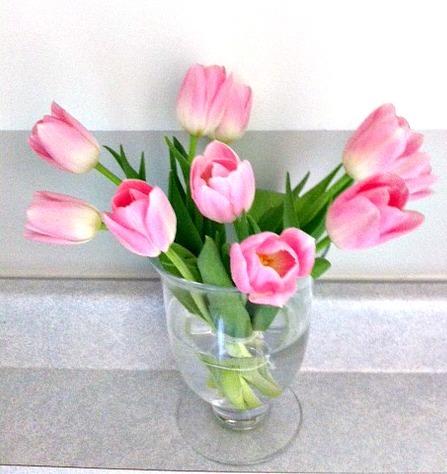 I finally finished our powder room face lift. Check that off the list of things to do while I’m on maternity leave! We didn’t have a big budget for this; actually, we didn’t have any budget so I kept it simple. 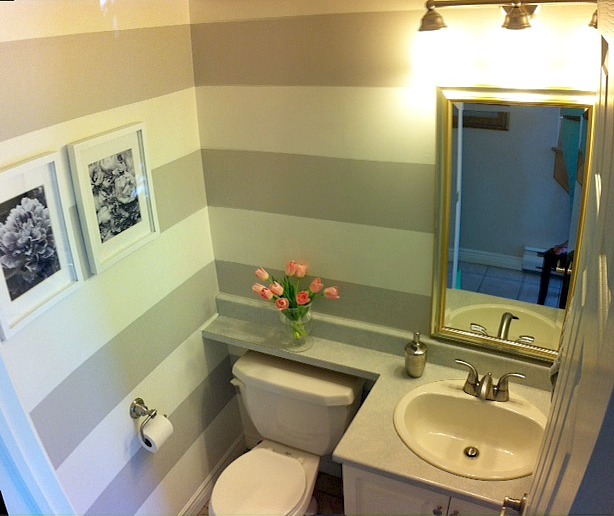 I already had the mirror (hand-me-down from my parents), I changed the light fixture and hardware (faucet, bath tissue holder and towel hook), and decided to go with horizontal stripes for the wall. The colors are Benjamin Moore’s Cloud white and Abalone gray (which were left over from painting the nursery). 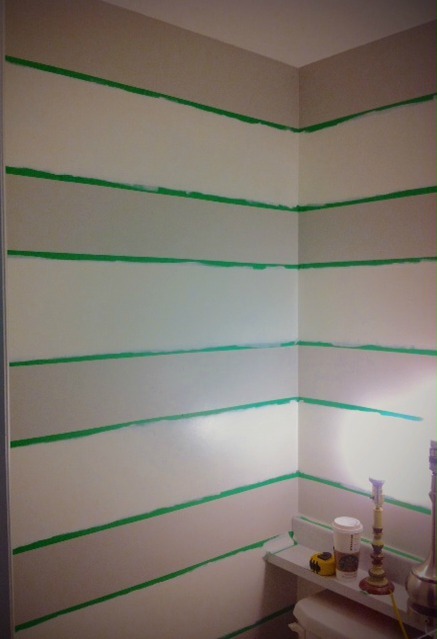 For the stripes, I found some instructions for painting horizontal stripes on Young House Love‘s blog. The most important thing to remember is to tape the outside of the lines for one color and the inside of the lines for the other. This is to make sure the stripes are all the same width. 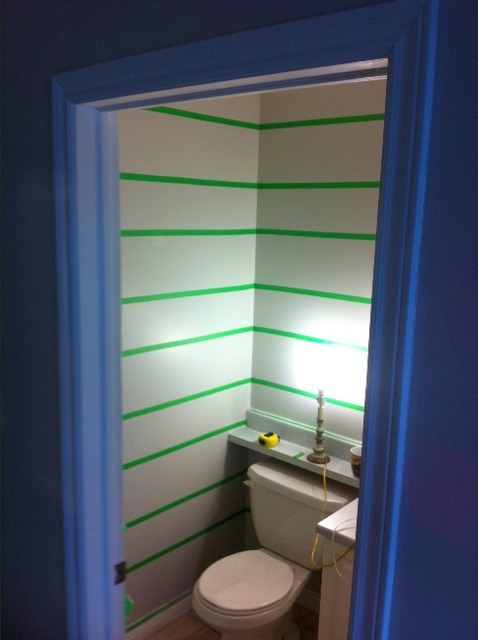 It took me ages to tape the tiny room, and some stripes are a little wavy, but it was worth it. 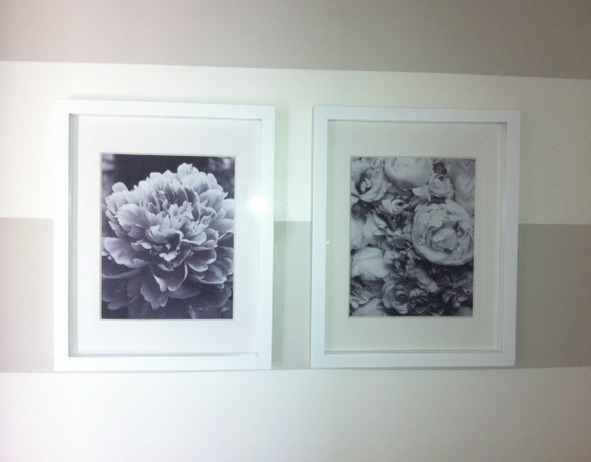 For the artwork, I bought basic white frames at Winners and printed photos of peonies found on google images. Here are some pics of the finished product. I hope you enjoy! p.s. Sorry the pics aren’t that great. I had some trouble since there isn’t much natural light in the bathroom. This looks amazing! I'm having a great time perusing your blog 🙂 All the best! It looks amazing!!! 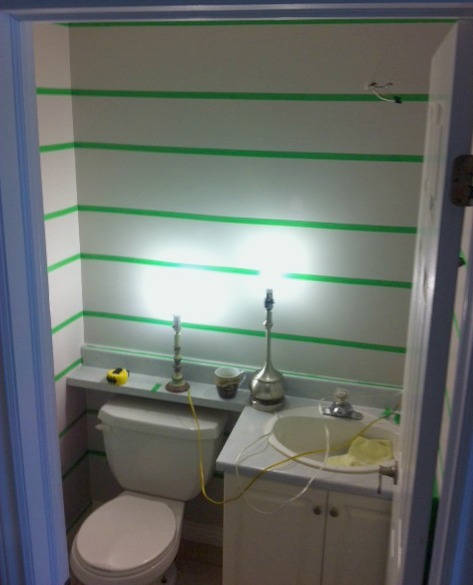 Now I want to do that in ours….it's so dark and I bet the stripes would brighten it a lot! Great work!